Posted on Thu, Mar 15, 2012 : 10:20 a.m.
NASHVILLE, Tenn. -- Ready or not, here it comes. The Michigan basketball team's foray into the NCAA Tournament begins Thursday afternoon when the fourth-seeded Wolverines take the podium for media sessions and hold court for an open practice at Bridgestone Arena in Nashville, Tenn.
From there, Michigan (24-9) will open Midwest Regional play on Friday against 13th-seeded Ohio (7:20 p.m., TNT). With the tournament now just around the corner, here are three Wolverine-related questions to ponder. Stu Douglass, above, and fellow senior captain Zack Novak have struggled with their jumpers recently. Are Novak and Douglass ready to shoot? No one will ever question Zack Novak and Stu Douglass' ability to lead, to defend and to do the various little things throughout the course of a game. But lately, the senior guards haven't exactly been dead-eyes from deep. Novak was 1-for-7 during a late-season win over Illinois, and struggled to find any rhythm before hitting a pair of key 3-pointers late in the team's Big Ten Tournament quarterfinal win over Minnesota. Douglass, meanwhile, was also relatively vacant during the Minnesota win -- until overtime -- and really struggled during the first half of the Ohio State loss. Michigan's main two top guns, Trey Burke and Tim Hardaway Jr., are the most important two offensive players the Wolverines have. But, in a tournament setting, senior guards like Novak and Douglass can be the difference between an early exit and a deep run. These guys have been here before, and they've both gone through their ups and downs as shooters. Neither player is too worried about it, though. "I still feel confident and everything," Novak said. "In the NCAA Tournament, the ball goes in the basket, so I'm looking forward to that." Jordan Morgan, above, must provide the "little things" in the NCAA Tournament. What can Evan Smotrycz and Jordan Morgan provide? With Jordan Morgan, things have become pretty simple. 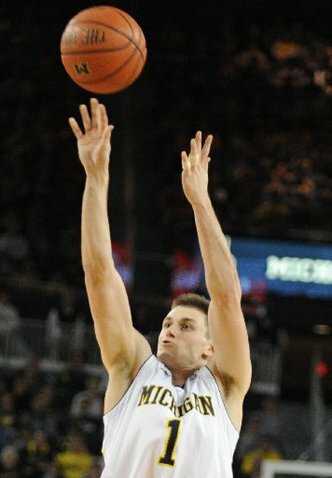 The 6-foot-8 forward doesn't have to be amazing for Michigan to win, but he can't be invisible either. Against Minnesota in Indianapolis, he did his job. He scored seven points, finished around the basket and grabbed four rebounds. Against Ohio State, though, he did not. Morgan struggled to stop Jared Sullinger, couldn't find anything inside and went 1-for-5 from the field. Considering the type of shots Morgan takes, 1-for-5 may as well have been 1-for-50. It wasn't a good day. "Consistency is a big issue," Morgan said. "I can get more rebounds, I can finish better, there are lots of little things I can do better to help the team." Smotrycz, on the other hand, is perhaps the biggest wild card of all. When he plays like he did during a 17-point showing against Penn State in the regular-season finale, Michigan is one of the most difficult teams to guard in the tournament. But when he vanishes, struggles to find energy and has issues with getting his shot off, the Wolverines are forced to rely far too heavily on Burke and Hardaway for offense. Smotrycz can be a nightmare for teams with size, or, he can be a liability. For the next three weeks, the Wolverines need the 6-foot-9 forward to be at his best. 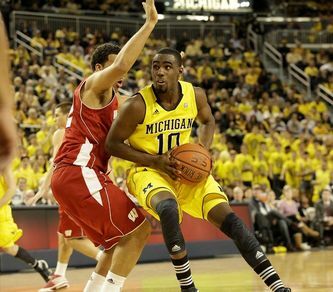 Tim Hardaway Jr., above, and Trey Burke must lead the Wolverines offensively. Are Burke and Hardaway ready to carry, if need be? Against Minnesota in Indianapolis, the answer to this question was easy. Burke and Hardaway combined for 50 points, and together, completely carried Michigan to an overtime victory. Against Ohio State the next night, though, the tandem was 4-for-22 from the floor on a night when everyone else on the roster seemed to be just as rough. A lot of players can have bad days and Michigan can still win. Novak can get in foul trouble, and the Wolverines can overcome it. Douglass can miss open 3's, and Michigan can survive. Smotrycz and Morgan can both have off nights, and the team has the capability to move forward. But Burke and Hardaway can't. For Michigan to win in this setting, their two best players have to be running at 100 percent efficiency throughout. Hardaway's slumps this season have been well documented, and when the lights got bright, he had a tendency to fade away. That can't happen now. Burke, meanwhile, never seemed to be fazed by any stage the Wolverines played on. He surprised a lot of people early, surprised even more with his consistency midway through the season and then looked like the best point guard in America last Friday in Indianapolis. But he does have weaknesses. When teams with length are able to take the ball screen away, he becomes dribble-heavy, and can settle for a forced shot rather than moving the ball around through the offensive set. Teams have 33 games of tape on Burke now, he's not sneaking up on anyone. It's March, and it's winning time. And now, more than ever, the Wolverines need their best to be at their best. Sat, Mar 17, 2012 : 1:29 a.m.
O-H-I-O...poetic justice is served! BYE BYE! Fri, Mar 16, 2012 : 12:42 p.m.
would offer this-------GOOD MINUTES. the way we play trey burke, zack, stu have to play almost 40 minutes. that is too much too maintain maximum efficiency . we need a few good minutes from matt vogrich and 20 good minutes from smotrycz . wish that there were another bench player we could depend upon for 10 good minutes. Buckeyes and MSU play a tough, tight defense that few other teams can. M should break their critical 33% conversion rate on 3s and get past Ohio. If they hit 40% or better they can beat any team in the tourney in that particular game. Live and die by the 3 will remain M's mantra until Mitch or Horford or someone can demonstrate a consistent viable inside scoring threat. I hope that happens while Hardaway and Trey are still on the team. To me, the key is Morgan. If Morgan plays strong inside, avoids fouls (especially those silly ones), is a scoring threat etc--Michigan is a MUCH tougher team to play. Obviously the other 6-7 players are important, but when Morgan is off as he was against Ohio last week, Michigan has a much much tougher time winning. And he has been good for much of this year--most improved player on the team. Thu, Mar 15, 2012 : 3:36 p.m.
With the way Michigan played in the B1G tournament? It is just natural for the media to have doubts. A good team should be peaking at this time and not regressing and this team regressed in the Purdue game and in the tournament. This team needs to show their A game and beat a higher seed at the sweet 16. .
Thu, Mar 15, 2012 : 3 p.m.
&quot;But Burke and Hardaway can't. For Michigan to win in this setting, their two best players have to be running at 100 percent efficiency throughout. &quot; C'mon, Nick, don't you think you are over-stating things just a *bit* ? They both have to play well, no doubt, but no one should ever expect 100% day after day. It's a team game, they all have to show up and contribute. And I think they will. GO BLUE!